Woah week 3 already, where has the time gone?? Last time I left off I ended without showing how my sink cabinet and pantry turned out. Well this week I figured its only fair to start off with that. I used the organizing and storage items I had before just in a more streamlined way. I edited and purged what I didn't need and finally got rid of a dozen or more nasty rags that were doing no one any good under there. I also got rid of many bottles of almost empty cleaning supplies, most of which were used up cleaning my kitchen from top to bottom. They were replaced with my favorite Method products and my tried and true favorite Bar Keepers Friend. Old glass vases that were set for the recycling bin got pulled out and were given new life as a dishwasher detergent holder and trash bag holder. Finally all my glass container hoarding paid off. I actually love opening up this cabinet now that doesn't give me the heebie-jeebies. I also love admiring my painting handywork. Its hard to tell here but the edges of the shelves are painted the same pink as my under sink cabinet. The bottom of the pantry also got a coat of pink paint following the major wood filler I had to use down there. After I got off the layers of shelf liner and paint from the shelves I painted the edges pink and cut fresh new white liners for the top. Since they were particle board, the liner was the better way to go since I didn't want it bubbling down the road. After I cleaned out all the old junk in there, I put everything I use often in airtight jars. Everything looks so much prettier when it is in a jar. It feels so good to have those two items crossed off the list. Cleaning and cooking aren't as awful as they used to be because I love opening both cabinets! 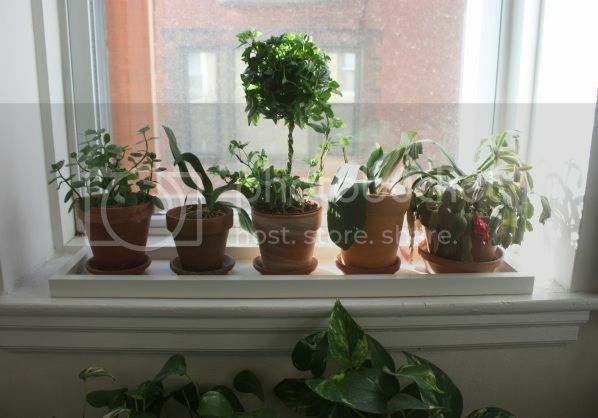 Next project on my list was doing something about the plants I had in my window. I have deep set windows, so there is lots of space for potted plants. I was using old Ikea plates as plant dishes, but I wanted something prettier and cleaner looking. I enlisted the help of my Dad and asked him to build me a long, narrow tray to house my plants. I wanted it deep enough to hide the saucers but still be able to see the pot. 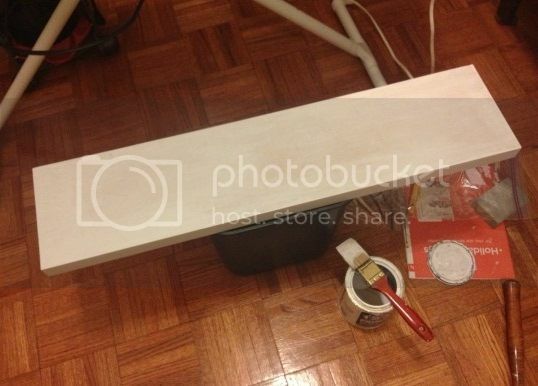 I wanted it to be durable, so I have it two coats of primer, and 2 coats of my favorite semi-gloss White Dove. Because it might get wet now and then I let it dry for over a week before I put it to use. It makes my window look so clean now, I love it. Thank you Dad!! I've still got more projects to finish and we are at the half way mark- guess I better get my work gloves on and get to work! Can you come to my house? I know it must feel so good every time you open it! Both the cabinets look so great! I am truly inspired to make some changes in my kitchen because yours looks so pretty! 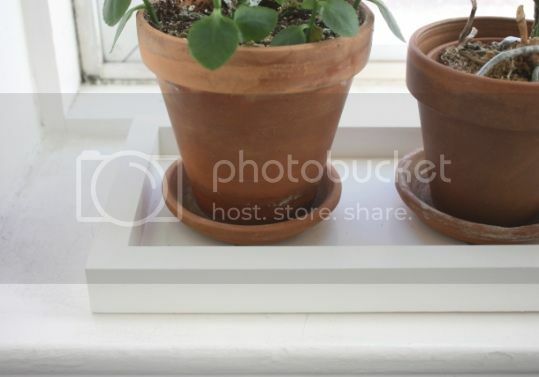 The tray for your plants is genius. Loving all the progress so far!! How I love your glass containers. You are inspiring me to get my kitchen organized! An organized space in pretty jars, perfection in my book! Looking good! Anytime you want to head down to Virginia and work your magic on my kitchen, you are more than welcome. This is an amazing transformation! It's nice to know that others take things out of the recycling bins, too. Hoarders, unite. Nice mixer, by the way. How simple and elegant is that small shell. Really, it's one of those things that makes you say, duh..wish I thought of that. I love what you are doing in your kitchen! Such practical and great looking things that really show how much you can improve a space...love this. It's looking great! Looks so great! Love the jars and agree that everything looks prettier in them vs. an ugly box. great job! Such wonderful organization - looks great! Ahhhhh organization is the prettiest! looks so much better! I love a good organization post! Fresh, clean and lovely....pretty color. It would make me happy to cook, too. 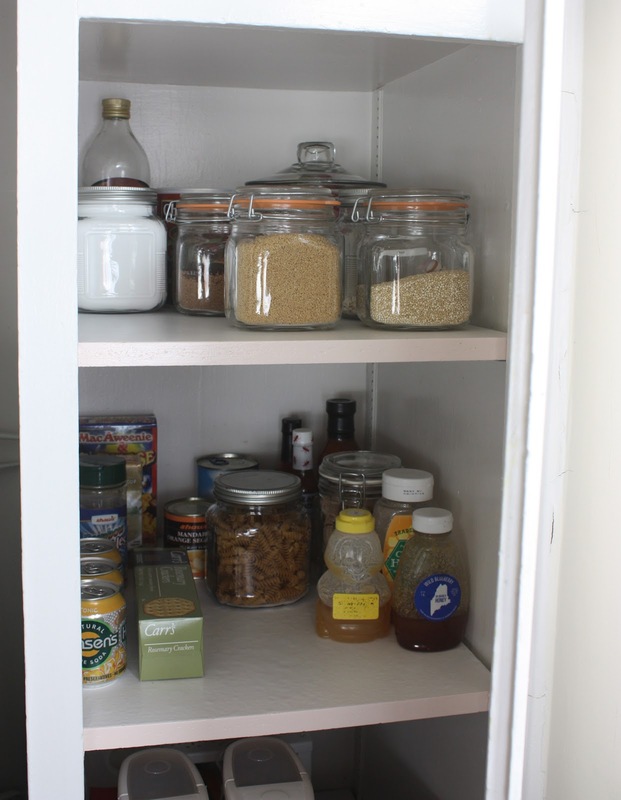 You must be so happy to open cabinet doors and see all that pretty organizing! I love the plant tray your father built! im so inspired to clean under my sink now! the plant tray & display is so cute! Soooo clean and fresh!!! Great job! 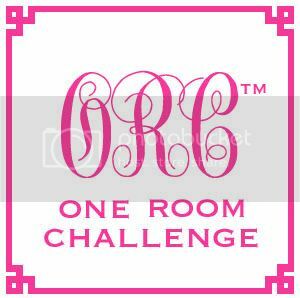 I LOVE the barely there pink color!! 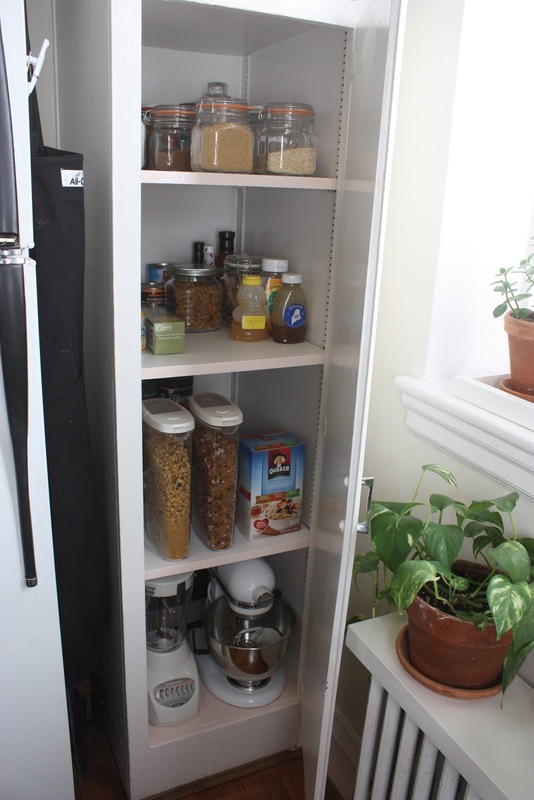 I'd be so happy every time I opened my pantry! Wow, so inspiring!! Love it! I agree with Haven & Home, it must feel so great every time you open up your cabinets! How great to get a little dose of pink when you open that cabinet! I love the plant tray, too. Mine just drip all over my windowsill - and it's not good. I love it all! I think bulk foods look fabulous in jars. Love your plant collection too. looks great! Organization makes everybody happy! You are getting me all excited to put my kitchen together! One, I need to get on some method cleaners. I'm pretty much starting fresh. Two- yes everything is SO much cuter in jars. Doesn't it feel so amazing to clean out your cabinets?? Love the organization and your potted plants! Job well done lady.